Designed to deliver up to 650W of total output power to your PC, the FOCUS 650W 80 PLUS Gold ATX 12V Power Supply comes with 4 PCI-E connectors, 8 SATA connectors, 3 four-pin peripheral connectors, and a single floppy connector, in addition to its standard motherboard and CPU connectors. Certified 80 Plus Gold with 90% efficiency at 50% system load, the FOCUS 650W 80 PLUS Gold ATX 12V Power Supply boasts a multi-GPU setup and tight voltage regulation. An embedded 120mm fan with fluid dynamic bearings is designed for quiet operation, optimized heat dissipation, and a longer life span compared to ball bearing fans. The fan's Fanless, Silent, and Cooling modes can be customized with a rear switch that disables the Fanless setting. 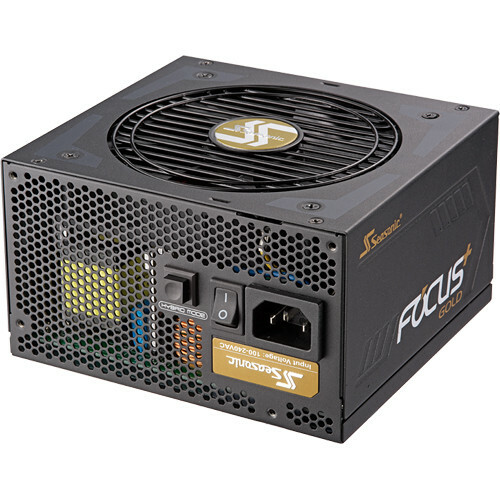 The 140mm-deep FOCUS 650W 80 PLUS Gold power supply has a fully modular design, meaning each its cables can be attached or removed depending on your PC's power needs. In addition, a cable-free connection between the PSU's back panel and printed circuit board (PCB) is designed to boost output power quality while also lowering the possibility of production errors. The Focus Plus Gold Series achieves 80 Plus Gold certification with its 90% efficiency at 50% system load. Instead of cables, the PSU's back panel and the PCB (Printed Circuit Board) are connected by a copper plate, a design that's intended to lower the chance of production errors during manual insertion as well as help to improve output power quality. This three-phased (Fanless Mode, Silent Mode, and Cooling Mode) thermal control is designed to achieve optimal between silence and cooling. The intended benefits of Hybrid Silent Fan Control include reduced noise without increase in temperature, extended fan life due to the reduced number of fan rotations, optimized heat dissipation, and silent performance in Fanless Mode. A button at the back of the power supply allows users to customize their cooling needs. Selecting the S2FC setting enables fan control without Fanless Mode, meaning the fan spins even during light loads, while the S3FC setting activates fan control including Fanless Mode, during which the fan does not spin during loads under 30%. High performance Fluid Dynamic Bearing (FDB) fans are designed to take advantage of the impact absorbance effects of oil. When the fan shaft rotates, high pressure oil drifts along the grooves of the bearing sleeve to generate a thin layer of lubrication between the bearing faces. As the speed increases, so does dynamic oil pressure and the shaft is lifted from the bearing to create smooth, effortless rotations. The herringbone shape of the groves helps to efficiently channel the lubricant and avert leakage. The lubrication of the bearing surface is intended to reduce friction and vibration, thereby lowering overall power consumption. FDB fans are designed for reliability and longevity, as well as to run cooler and more quietly than ball bearing fans. Box Dimensions (LxWxH) 12.4 x 7.4 x 4.7"
FOCUS 650W 80 PLUS Gold ATX 12V Power Supply is rated 5.0 out of 5 by 3. Rated 5 out of 5 by minh from Awesome PSU with no noise! This PSU is a very efficient and quiet PSU and it looks so clean with the modular design. I love that the SeasSonic 650W has 5 CPU/GPU connections unlike Corsair RM650x and EVGA G3 650W which only give you 3 which is not enough for SLI with higher ends cards which require 2 connections per card. Can this PSU ship to Brunei Darussalam? We offer international shipping on most items. Add the item to the cart online to calculate.